Pune clinched the second position in urban governance in a survey conducted by a Bengaluru-based advocacy group, Janaagraha Centre for Citizenship and Democracy. Pune was in the fourth position last year. 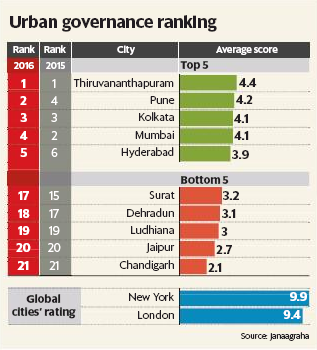 In the fourth edition of the Annual Survey of India's City Systems, Thiruvananthapuram topped the list. The study was conducted in 21 leading cities in India. The data collection was done for six months. The cities were marked on a scale of 0 to 10 on different parameters, with 10 being the highest. Pune's overall score was 4.2. Thiruvananthapuram bagged 4.4, while Kolkata emerged third with 4.1. Factors such as revenue generation and use of information technology helped Pune improve its ranking. The report claims that Pune is the only city providing comprehensive information on scheme and services to its citizens. It is among the few cities generating over 50% of their expenditure on their own. The city stood sixth in factors such as investing adequate funds in public infrastructure and service, below Mumbai, Surat and Ranchi. According to the report, Pune stood third as far as the availability of skilled human resource. Pune stands third in providing information to citizens, citizens' participation and addressing citizens' complaints. The report is based on four components -urban planning and design, urban capacities and resources, empower and legitimate political representation and transparency, accountability and participation.